Terra Forte use Vermeer Terrain Leveler surface excavation machine from Vermeer Australia for Soil remediation operation in Croatia. As part of a programme of planned soil remediation, the Croatian government and Croatian Foundation for Development are preparing large tracts of land for agricultural use. The goal is to establish new level areas to plant both olive trees and vineyards. The ground comprised of 70 percent hard rock and only 30 percent soil, which has to be leveled and excavated to achieve the correct land levels and soil depths. To achieve this, contractor Terra Forte decided to use a Vermeer Terrain Leveler surface excavation machine known as Vermeer T855, from Vermeer Australia. The T855 COMMANDER 3 with a Terrain Leveler is powered by a 335 hp (250 kW) Caterpillar engine with an operating weight of 43 tons (86,000 pounds). The units will utilise a Terrain Leveler attachment with a width of 8.5 feet (250 cm). Work on the first part of the project began in early March 2007 and is expected to be completed in about three years. During the first phase, only one machine will be utilised. However, there are plans to introduce more machines on sites along the Croatian coast, as well as other island sites, to level as much of the land as possible before Croatia joins the European Union. Under the supervision of the Croatian government through its state-owned companies, most of the planned project sites commenced work in 2007. A second project will be in the Istria region, where around 988 acres (400 hectares) will be leveled. Subsequent to this, other sites will follow, one by one, along the Croatian coast. This decision was made on the strength of the machine’s capacity to produce consistent spoil up to 2 inches (5 cm) in size while keeping a constant digging depth of 20 inches (50 cm). 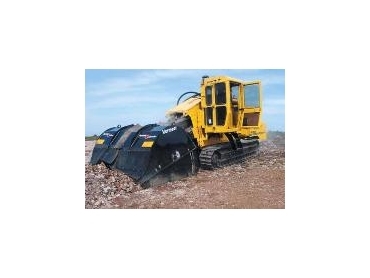 If a machine were to be used for the work that utilised normal rippers and hydraulic hammers, it would be impossible to effectively control the spoil size and make it very difficult to control the digging depth.